What should be done with the Career-Development and Career tags? I believe The Community's position on questions that relate to the non-technical aspects of system administration and support jobs are outside the scope of this site. A quick stroll through the tagged questions shows a lot of closed questions, a lot of upvoted "What should I do so I can get Job X" questions and few ones that are probably worth saving (How to encourage Windows Administrators to pick up scripting, The Joel Test for Sys Admins, and How to Interview for a Sys Admin Candidate). There is some ambiguity, especially for "junior" SF members like me, in seeing many open and upvoted Career Development-style questions, because it seems to indicate that they are on-topic. They're either appropriate or they're not; consequently The Community should either clean house or be more open to the consideration that they're on-topic. Careers questions are a bit of a strange beast. Joel and I always intended them to be on-topic on Stack Overflow, but.. well, keep reading. Which type of “programming related” questions are appropriate [on Stack Overflow]? strongly on topic: Technical questions. weakly on topic: Career and hypothetical questions. off-topic: Hardware, Polls, GTKY, Other. Interestingly, the community views career questions as only weakly on topic. This definitely supports the split of Stack Overflow and programmers.stackexchange.com in my opinion; these are (sometimes) good questions but the community prefers the hard technical questions over the soft career stuff by a voting margin of 3 to 1. In response to Jeff's Answer, while the original intention might have been for career questions to be on-topic, it was also not an original intention to have SF or SU or the other SE sites. The community has evolved and while the SF community might not be as large as the SO community, the divide in topics runs along similar veins. As the sites are structured now, career topics do not belong on SF. 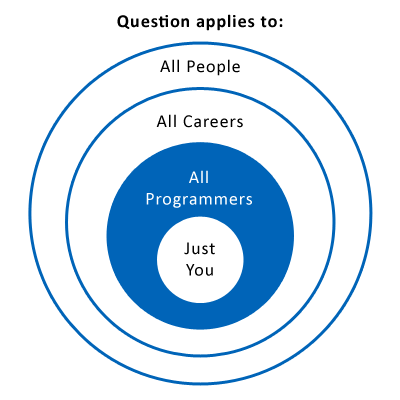 Just like career advice belongs on programmers.SE and not SO. The only real difference is that SF doesn't have a sysadmins.SE site.